Central to the development of the area surrounding the Ames Building was the construction of the first Town House. After the founding of Boston, residences occupied this area, and the home that occupied this land belonged to Reverend Henry Dunster, who became Harvard College’s first president in 1640. In the middle of Washington Street, adjacent to the home, the town dug the colony’s first well. 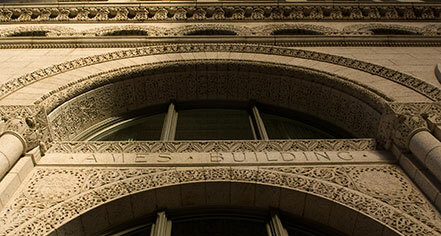 The Ames Building occupies a site on one of Boston’s most historically significant corners. This intersection of today’s State and Washington Streets has witnessed some of the more important events and changes in the growth of Massachusetts. At one time Washington Street was the only road that crossed the thin neck of land that connected the Shawmut Peninsula with the mainland. Its prominence as a major thoroughfare increased with construction of Long Wharf at the foot of State Street. Food and other goods were brought uphill to the intersection of Washington Street where many continued to travel down the neck. Eventually a market was established on the site and the intersection rapidly became the meeting spot of the new town. From that point on, the area changed quickly and two- and three-story buildings that housed homes and shops filled the area. The building that we know as the Old State House was constructed in 1712 and the town marketplace became the host of many events that lead to the Revolutionary War. After the War, a triumphal arch was erected in honor of George Washington on Washington Street, just north of the Court Street intersection. With the gradual location of the city’s financial interests along State Street in the mid-1880, the buildings grew to three- and four-stories. This is the time where F.L. Ames introduced his fourteen-story building. As the city’s land use polices were just being formed when the Ames Building was being constructed, the only regulations where those of issues surrounding fire safety, health conditions, and overcrowding. It wasn’t until 1898 that the state authorized the city to control use, density, and building dimension. The maximum height restriction of 125 feet was established three years after the 196 foot tall Ames Building was completed. This restriction remained in place until 1964. At the time the Ames Building was constructed, it was the tallest masonry building in the United States. It was surpassed six months after opening by the Monadnock Building in Chicago; today it remains the second tallest masonry building in the country. The building was commissioned by the most important patron of H.H. Richardson, Frederic Lothrop Ames (1835-1893), who was a member of the Ames family of North Easton, Massachusetts. F.L. Ames was the most financially successful member of the family. Beside the family business, F.L. Ames was involved in the Union Pacific Railroad, and started his own railroad (Old Colony), his own bank (Old Colony Trust), and speculated heavily in real estate. It was construction of a building that first brought him to contact Henry Hobson Richardson. The Oliver Ames Free Library in 1877 in North Easton was the first of twelve commissions the Ames family would give to Richardson. Mr. Richardson died in 1886 and would have probably received the commission to design the Ames Building, but it was awarded to the firm of Shepley, Rutan, and Coolidge. The record books of Shepley, Rutan, and Coolidge list no fewer than 34 separate jobs for members of the Ames Family between 1886 and 1909; all but seven are attributed to F.L. Ames or his estate. The construction of the Ames Building was completed by the Norcross Brothers of Worcester. The Ames Building is architecturally significant as a major work of the nationally prominent Boston architectural firm, Shepley, Rutan, and Coolidge. George Shepley graduated from M.I.T in 1882 and joined H.H. Richardson’s office as a draftsman. Charles Hercules Rutan began his training with the firm of Gambrill & Richards in 1869, and was promoted to draftsman and eventually became one of H.H. Richardson’s chief designers. Charles Coolidge attended both Harvard College and M.I.T and received his early training in Richardson’s office. After the death of H.H. Richardson, the three formed a partnership to complete the 25 projects left in Richardson’s office. Those projects included the Allegheny County Courthouse in Pittsburgh and the Marshall Field Warehouse in Chicago. Those designs were noted as among Richardson’s best. The list of the firms’ commissions is long and distinguished. Their most significant works include the original buildings of Stanford University (1890); the University of Chicago; the Chicago Art Institute and Public Library (1893-97), and the New York Hospital. Their work in the Boston area includes the Flour and Grain Exchange (1892), the tallest building at the time of its completion, the First Parish Church in Brookline (1892), South Station Terminal (1899), and numerous buildings at Harvard University and Harvard Medical School (1903-1907). The firm is currently known as Shepley, Bulfinch, Richardson, and Abbot. The 100 year lineage makes the firm the second oldest continuing architectural practice in the country. The Ames Building represents the work of a notable construction firm, the Norcross Brothers. 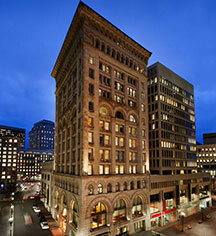 This firm is associated with many of Boston’s most significant late-19th century buildings and with almost all of H.H. Richardson’ best known designs. They are known in the industry for their innovative construction techniques. The firm was among the earliest builders to become general contractors and one of the most important construction companies in America in the late-19th and early-20th centuries. The Norcross Brothers provided building materials from their own granite, slate, and marble quarries, kilns, mills, and ironworks. They provided services as engineers, consultants, estimators, and suppliers of material and skilled craftsmen. The Norcross Brothers built more than fifty percent of Richardson’s designs and most of the major commissions. Their most significant works include the New York Public Library, the Rhode Island State House, The Corcoran Gallery and Scottish Rite Temple in Washington, D.C., and the remodeling of the White House. The Hercules ship brought the Ames Family to Massachusetts in 1638. After several generations of farmers and blacksmiths, John Ames of Bridgewater became the first American to manufacture shovels. John’s son, Oliver Ames, moved to North Easton where he took advantage of the town’s tradition of iron manufacturing and established the Ames Shovel Works Company in 1803. This company would grow to be the largest and finest shovel manufacturer in the country. The early 19th century was a good time to be in the business of making shovels and picks, as the new nation was expanding at a rapid rate and major public works projects were underway, which relied on manual labor. Those laborers created a demand for hand tools. In the Mississippi Valley, an Ames shovel was considered so valuable that it was declared to be legal tender. The Ames company made a fortune selling shovels and picks to miners during the California Gold Rush. Ames shovels were shipped to every part of the nation and world, from the gold mines in Australia to the diamond mines in South Africa. The Civil War made them even the wealthier with the need for shovels and swords. Oliver’s sons, Oakes and Oliver, Jr., grew up in the shove-making business and the company was renamed Oliver Ames and Sons. By the 1850’s, the brothers were middle-aged men of wealth and influence. Oliver Ames, Jr. was elected to the state senate in 1852 and 1857, while Oakes served in the U.S. Congress from 1862 until 1873. In January 1865, President Lincoln called Congressman Ames to the White House. The President believed that a transcontinental railroad was the key to tying a fragile union together. The competing efforts of the Union Pacific and Central Pacific Railroad Companies were suffering from infighting, poor management, and inability to raise the capital required. The Ames brothers jumped on the opportunity and in 1866, Oliver took over as president pro-term of the Union Pacific Railroad. He invested in Credit Mobilier, a construction company that handled contracts for the railroad. Oakes was one of the largest stockholders of Credit Mobilier and he used his position in Congress to influence legislation favorable to the railroads. On May 10, 1869, both Oakes and Oliver were in Boston when the “Golden Spike” was driven into the railroad tie connecting the Union and Central Pacific lines. The Ames shovels, their management, and their money had been critical to bringing about this historic event. The Union Pacific Railroad, headquartered in Boston, was deeply in debt. An investigation began and found that Credit Mobilier’s construction company charged Union Pacific an inflated sum for its work and Union Pacific had paid the bills with government funds. The resulting financial scandal was long considered the most serious in U.S. history. The investigation focused on Oakes Ames. In 1873, the House censured him and he returned home to Easton a broken man and died a few months later of a stroke. Frederick Lothrop Ames, who commissioned the Ames Building, was the son of Oliver Ames. A few years later, the Union Pacific hired the great American architect, H.H. Richards to design a monument to the Ames brothers. Today the monument stands isolated in Sherman Summit, Wyoming. Originally it was the highest point on the Union Pacific line and visible to all passing trains before the route was moved. The Ames legacy can be seen all over Easton. Although, the shovel company left the family and moved to West Virginia in the 1950s, the family left a lasting mark. H.H. Richardson designed the Oakes Ames Memorial Hall, the Ames Free Library, and the Old Colony Railroad Station which is now the Easton Historical Society. Ames Boston Hotel, a member of Historic Hotels Worldwide since 2016, dates back to 1893.